Growing up for Art Diogenes has meant cultivating a classier aura than your average Greek eatery. During its seven-year existence, Art Diogenes has undergone an impressive five separate renovations. Each one, says owner Zoran Kovačevič, building on a successive layer of class. Upon entering the hushed, deep maroon interior of Art Diogenes, its owners’ protestations seem perfectly unnecessary. Exclusivity has quite obviously been bestowed upon the environs – from the sleek, clean line of the design to the charming affability of the wait staff. A pleasant counter to the relative solemnity of the basement is the more airy upstairs, which has more the feel of a café than a restaurant. One can find familiar Greek standards like tzatziki (yogurt with cucumber and garlic) and musaka (minced-meat with aubergines) at Art Diogenes. 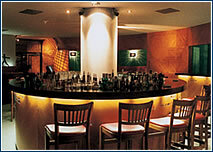 But what truly distinguishes its menu is the prodigious amount of seafood available – roughly 70% of the mains on offer. Thrice weekly, deliveries of fresh fish arrive. The ordering of a whole fish – sea bass, red mullet and halibut are a few regulars in the rotation – is a comprehensive process, beginning with picking your prey where it sits raw on a platter, choosing how much is to remain when cooked, and then on to the final presentation. Kovačevič claims that the process helps encourage those (and there are many) who are normally reluctant to eat seafood in this town. It makes them feel just a bit better to glimpse the preparation from beginning to end. “I’m not Greek,” says Kovačevič, “but I’m glad to say that Greeks – local businessmen and diplomats – like what we do, and respect us. And help us with tips on how to do things.” The owner’s infatuation with Greek cuisine has reached the point of religious convert – he once enlisted a Greek scholar to help him compile a menu culled from texts some three millenniums old, including a risotto made from kernel and barley. His regular menu, while not quite so rare, contains numerous pleasures, such as vine leaves stuffed with minced meat, risotto with squid and tiger prawns. 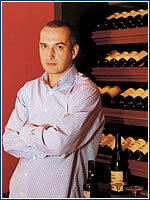 Kovačevič has become something of an advocate for Greek wines as well. In one instance, he managed to convert one regular to a Greek Chardonnay after he’d clung adamantly to a French variety. 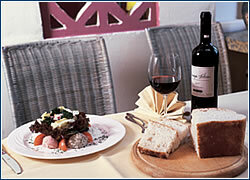 Apart from Greek, the wine list includes a generous smattering of vintages from Cyprus and France. Kovačevič is also an extraordinarily pleasant host. A native of Sarajevo, he brings a certain Balkan warmth to his adopted Bohemian home. Only 23 when he first opened Art Diogenes, he’s received a hands-on education as a restaurateur, while watching the general dining scene here develop nicely. His sole lament is that he wishes he’d found a location more accessible than one tucked in a small street behind the Fred and Ginger building near the river in Prague 2. However, he need not fret too much, as his restaurant seems to have garnered a very faithful clientele. Many show up and order without even first looking at a menu, simply tossing off requests and a general outline of what they’re in the mood for – something the owner actively encourages. TABLE SCRAPS: A few Christmas tips:· Festive dishes, from appetizers and special foie gras to stuffed turkey and cakes from Le Traiteur catering. Orders must be placed two or three days in advance. Tel: 724 077 274. 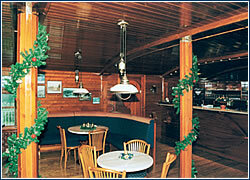 · The French Restaurant in Obecní dům offers hot and colddishes for the holiday season. Orders to go must be placed ten days in advance. Tel: 222 002 770. · If you do not want to bake at home, you can purchase Christmas bread, honey gingerbread and various pasteries in Paneria bakeries. For butter cookies in a decorative container (0.5 kg) you pay CZK 350. · Also in Bakeshop Praha (Kozí 1, Prague 1) they prepared 10 kinds of Christmas cookies (CZK 20 for 100 g) and lots of specialities. For instance Italian cake Panettone, 1 kg for CZK 1000, or French Yule log, CZK 600 or 900, depending on size. Tel: 222 316 823. Less than two years ago a restaurant and café in Děčín brought back the magic of a First Republic establishment that was called Paroloď, and the ship is truly reminiscent of the times. The experience is intensified by the lovely view of the Labe (Elbe) river, which flows by right under the windows. The restaurant offers traditional Italian cuisine, featuring a local specialty, Sicilian Cat – lamb with potatoes cooked in aluminum foil with cheese sauce – as well as 100 kinds of pizza, steaks, and short order dishes. Czech, Moravian, and Italian wines are on the wine list, and you can top off your gourmet experience with a large selection of desserts, including “Hot Love”, delicious, warm raspberries with ice cream. Additionally, every other Thursday Paroloď organizes evenings of live music. You can’t miss the big arched bridge over the Labe in the center of Děčín. Nearby on the right bank is the restaurant, which has convenient adjacent parking. YOU’VE JUST watched a movie at Slovanský dům, and you’re wondering where to get a drink or a bite to eat. The answer is right under your feet. Well-known local restaurateur Frank Haughton has just opened an impressive bar/restaurant that combines the best elements of coziness and chic. In a uniquely styled interior, diners can enjoy what the owner has intended to be “upscale cuisine at a fraction of the cost”. Anyone sampling the crispy duck confit, roast leg of lamb or fresh spinach salad from the menu will find it difficult to argue. In addition, with top local and international bands on weekends, The Joshua Tree offers an alternative to the nearby silver screens. Where in Prague would you take your family for Christmas dinner, and why?